There’s a lot that goes into defining and communicating your brand; first you must know what your USP (unique selling position) is, then you must be able to sum up the vibe of your brand and then you must determine how you’ll communicate that vibe. Your brand should come through in even the smallest details of your business and these ideas are ways to help you do that. If you would like help determining your USP (i.e. what you do differently or better than the thousands of other businesses selling a similar product) and branding, please sign up for my FREE 5 day challenge BEAT LAST YEAR’S SALES. 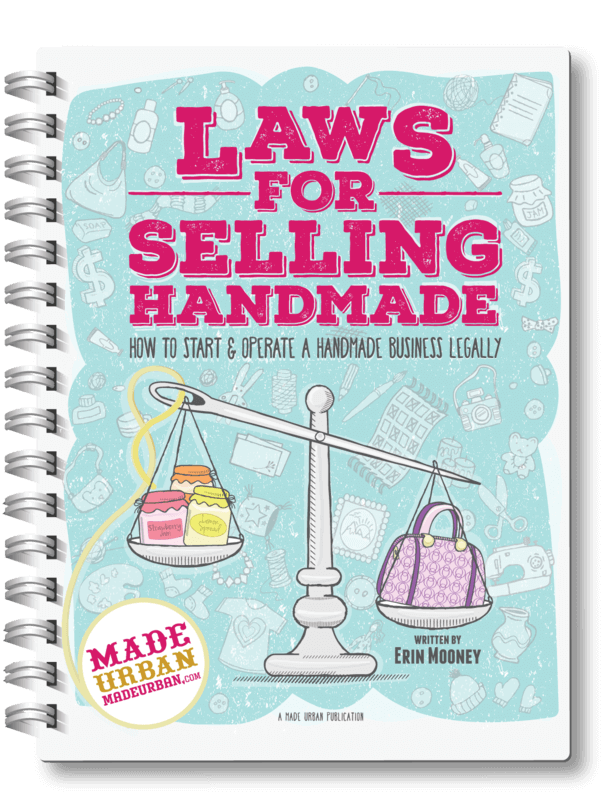 The challenge will spark ideas for your USP and branding and share lessons from my ebook HOW TO SELL HANDMADE BEYOND FRIENDS & FAMILY, which goes into extensive detail about how to determine, define and communicate your USP and brand (as well as many other important lessons). Some of these ideas are for outdoor markets or bigger booths and some will work no matter where the market is held or how big your space is. Try to let these ideas spark ones of your own. If you’re selling scarves or handbags that people will want to try on, give them a proper space to do so. Set up a little area with a full-length mirror and maybe even a chair if you have a bigger booth; that way their shopping partner can sit and help them decide. Just like a mini dressing room. You could also have a small table next to the mirror with a flip-book showing how to wear the look, the trend being worn on celebrities, additional options you offer, etc. This idea can be used in a smaller space too. You could place a full-length mirror in front of your 8 foot craft show table and on the corner. Just be sure it doesn’t spill out into the aisle and take up more space that you’re allotted. If you’re selling hats or scarves, you can get away with a tabletop mirror at one end of your table, where shoppers can try items on, off to the side so other shoppers can still browse your table. Be sure to keep the mirror on-brand. If your brand sells luxury, your mirror may have an ornate gold mirror. If your brand is more playful and whimsical, a colorful glossy plastic mirror may be more fitting. You could play music that fits with the mood or theme of your art. You could also use a subtle scent in your space. An infuser could add the scent of pine when selling landscape paintings of the forest/mountains/etc. The scent of five-cent candies could work for children’s art. Or the scent of food for a vendor offering food-themed paintings for the kitchen. For example, lemon scent to go with a feature collection of lemon paintings. People will feel like the art has come to life or like they’re a part of the painting. Keep in mind that some people have scent sensitivities so keep them subtle. But scent is everywhere in this world and is a big part of memories, marketing and branding, so don’t be afraid to use it. Bath & body products make me think of a spa or pampering myself. It feels like you’re doing something good for your body when you splurge on a nice face wash or hand cream. If that feeling is a fit for your brand you may consider creating a true spa-like atmosphere at your booth or table. You may want shoppers to have clean hands when they sample your product so they can really feel the difference your products make. You could invest in a spa cloth warmer and sterilization unit. That way you can offer a warm towel for shoppers to cleanse their hands before trying your lotions. A brand that has a vintage vibe to it could create a wash station by setting up a pitcher full of clean water and water basin so you’re able to pour water over shoppers’ hands as they lather one of your soaps and release the scent. You would need a larger bucket under your table to be able to pour dirty water into and a place to dispose of the dirty water when the bucket is full. Music can also create a spa-like atmosphere. The sounds of nature would be fitting for a brand that offers environmentally friendly products and packaging. A small plugin water fountain can also create the soothing sound of running water. Battery powered, flameless candles can create a warm, relaxing atmosphere. This is a product you can have fun with recreating the setting you intend your candles to be used in. If your candles are for relaxing bath time, create a spa-like atmosphere with flameless candles, a book and bottle of wine in an ice bucket. If your candles have beautiful containers, you may create a vignette and show how lovely a candle can look as part of a display on a fireplace mantle, book shelf or kitchen counter. Consider the vibe of your brand, how you want people to feel when using your candles and the setting they may light them in. Then figure out how you can communicate that vibe, feeling or setting. If it’s a kid filled event, you could place a small play station just inside your booth. Think about the little areas you see for kids at a doctors office. It doesn’t need to be a large space, just a small area blocked off with a few toys or coloring station. If you don’t have enough space for a play area, you could have a small bowl of suckers or candies that will catch kids’ eyes and get them pulling their parents over to your table. You may want these at kid eye-level so they notice them but out of reach so they can’t just help themselves and must ask mom or dad first. If your product is something kids are interested in (e.g. toys are something children have an interest in while clothes are more interesting to the parents), create a sample area for the kids to test your items out. Remember to lower your display if you want it to grab children’s attention. A toy sitting above eye-level is likely out of sight and reach for a small child. If you’re selling food, offering samples is obviously a great way to lure shoppers over and encourage them to buy. Think beyond your product and help taste-testers imagine all the possibilities. For example, instead of a small paper dixie cup with a spoonful of jam, show shoppers how they can wow dinner guests with their appetizers by allowing them to taste how amazing your jams are on a cracker with a slice of cheese. You may also consider offering hand sanitizer so people can clean their hands before and after they try a sample. Napkins can also be branded if you’re handing samples to people on a napkin or giving them one to wipe their hands after sampling. If your food has a lot of garlic, a bowl of mints will also be appreciated. If your food item isn’t something you can offer samples of all day (e.g. hot soup…although you could use a crockpot to keep soup warm and spoon up small samples on demand), consider indulging the other senses. Scent is an obvious choice; allow shoppers to smell all the fresh herbs and spices in your soup mixes, sauces, etc. by displaying a small branded jar they can open the lid on and smell a sample. Or, including fresh herbs in your display can add vibrant color, communicate how fresh your ingredients are and add a subtle scent to your space. Velvet trays would allow items like jewelry to be laid out so they can see how pieces look together, while adding a touch of luxury. Just like the idea in the “Accessories” section, you could create a small area where people can try the items on while being out of the way of other shoppers. Just be sure that area is within view as small pieces of jewelry are the easiest to walk off with at an outdoor market. If you’re selling pet accessories at an outdoor market where shoppers will have their dogs with them, consider a dog station. You could purchase a stake from a pet store that can either go into the ground if your booth is on grass, or create a free standing stake by setting it in a container filled with concrete and allowing to set. Make sure it’s heavy enough that the dog can’t pull it with them. A sign stating owners are to use at their own risk may also be a good idea. Add a couple bowls for water and owners can now clip their dogs to your stake while they shop in your booth. You could create a fun display by recreating a setting your pottery might be used in. If your pottery is made for lazy weekend mornings to sip coffee and serve scones and muffins, a cozy chair with a book folded over the arm, sitting next to a small side table with a mug and bowl from your newest collection would create an eye-catching display. This could take up a corner of your booth if you have a bigger space. It could also be done in an 8 foot space if you skipped the traditional craft show table, added a smaller chair and side table (one with drawers would add extra storage space) and used a taller display shelf to display all your products. If you’re selling serving dishes, you could set your craft show table up like a dinner table. Go all out creating the ideal setting your serving dishes would be used in, with three table settings of plates, forks, knives, wine glasses, cloth napkins and placemats. Your serving dishes would be displayed down the middle of the table, just as they would at a dinner party. You could even add faux food to your serving dishes, as long as it doesn’t lower the perceived value of your products (e.g. cheap plastic play food may make your pottery look cheap). If you’re selling your art on cards and stationery, try using an idea from the “Art” section. Think about how you want people to feel and add props to communicate your brand’s vibe. For example, if it’s humour, add some silly props to your space. If it’s organization (e.g. you’re selling printable checklists, to-do list notepads, calendars, etc.) your space should have a spot for everything, use clean lines and feel very organized. If you’re offering items people may want to mix and match or grab more than one, you could offer baskets so shoppers can pick out their items but keep their hands free. For more ideas on creating a powerful craft show display, no matter what you’re selling or the size of your space, join my FREE challenge 5 DAYS TO A STANDOUT DISPLAY. Lean more about the challenge here or sign up below! 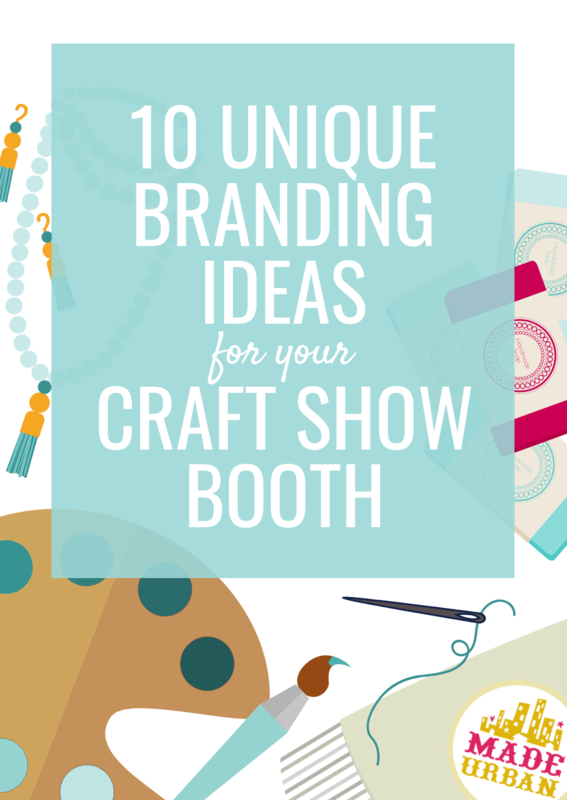 How are you going to brand your craft show table or booth and create a unique experience for your shoppers? Share in the comments!